LOONNNGGG TIMMEEE NO SEEE XDD! Im veeeryy sorry ;_; My college is using all my time! But I doubt that anyone still remember me... But! Anyway! This is the second wally that I finished using my tablet *3*, So I ended I was soon uploading it here and in my other gallery at AS(Anime Spirit), I aways wanted make a wally from D.Gray-man, because Allen is ALL THAT *-*(luv him for the extreeemmmee >.<)! By the way! The lineart was made in Illustrator in about 2h, and the colors was in Photoshop and Paint Tool Sai in about 6h, the background I used some brush and plug ins. Mii-chan <3 Long time, no see from you! Nice wall you have here though there are a few things I'd like to see different. Allen & Lavi are nicely done, the one that needs work is Kanda. Instead of making his hair black you could have done dark purple/blue to make it more interesting. Also, you could have made more highlights on the hair and skin. Some of the lines are too thick imo. Haha so cute! 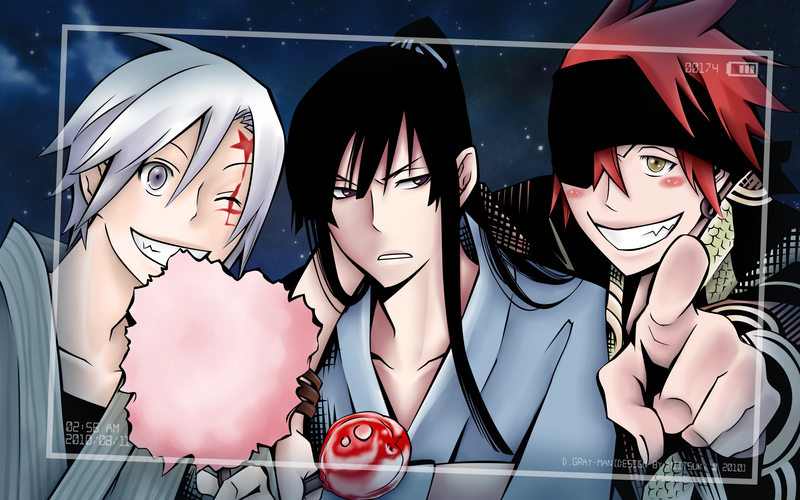 D. Gray-man needs more happy scenes like this one. thank you for the wallpaper! ??????? ?????)) ??????? ?? ????????! Thank you for sharing!They are so happy here! oowwwn! is sooo cuuuuteee! hihi! thaanks for sharing!